azalvo is not a co-working space; our intention was never to simply rent out a beautiful space. We conceived azalvo as a co-creation community, where our clients are our partners and together we work to create something innovative and sustainable. We are here so you can focus on your talent, so you can leave your frustrations at the door (with us, that is). We’ll walk you through it, guide you in directions you didn’t think you’d venture and tackle the trivial parts for you. You’ll learn from the brands that have succeeded before you and also from those that have failed before you. We understand it can be easy to launch a business. Technology and our unlimited access to information has allowed a world of entrepreneurs to create and innovate. There is a problem, however. It is that most believe the one and defining key to success is abundant funding. But while funding is necessary and crucial, it does not guarantee longevity. The harsh truth is over 60 percent of venture capital-backed startups fail. Most fail not because it was a bad idea to begin with. Anything can happen; we’ve seen it all. Inexperienced entrepreneurs are unsure of how to manage and expand sales, marketing and operational teams, for example. Or take, for instance, a designer who acquires funding and launches her brand. It’s edgy at first, evolves to become mainstream over the course of three to five years. It’s success on the surface but finances are mismanaged; credit lines are over-extended, suppliers can’t be paid, creditors are alerted by insurers. Within one season, everything unravels. Many entrepreneurs don’t realize that much more than sales and turnover, it’s about healthy cash flow. At the end of the day, investors are looking for a return on their investment. There is a lot to learn. And that’s where we come in. My family’s umbrella company, Aussco, was a textile manufacturing company founded by my grandfather in the 60s. In the last five decades, we’ve helped hundreds of brands succeed. Our success rate is roughly 80 percent. We’ve evolved to establish Indhouse, where we have a dedicated team that has overseen the development of samples prototypes and patents for over 50 brands a season. 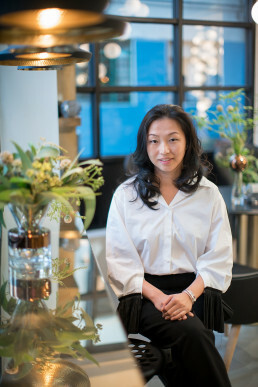 We’ve expanded to the homeware and lifestyle sector with A Matter of Design, which has introduced brands such as BoConcept and Tom Dixon to Hong Kong. It was built for us to understand the processes of marketing and brand building, distribution and licensing, retail enterprise resource planning (ERP), point of sales (POS), operational and logistics, in addition to customer service and finance. And then we thought: why not apply what we have to build a platform to help construct and grow promising brands? We created azalvo because we have the experience. We want to incubate talent that is already there, working with fashion, accessory, and lifestyle startups and brands in need of a sounding board, deliverables and growth. We want to co-create by investing our expertise, business acumen, resources and technology to help great ideas flourish into successful businesses. Don’t stray from the dream. As long as you’re focused, everything else will follow.